Earlier today I wrote about the difficulty that hurricane forecasters were having in making a good forecast on where Erika is going. Here’s a little more information to show you just how tough it can be. Hurricane forecasters, like weather forecasters and climate modelers, use a variety of computer models to simulate what the future atmospheric conditions might be. Each model has its own set of equations, surface conditions, time steps, etc., and so each produces different results. When all the results from all the models are close together, the forecasters have a high degree of confidence in the forecast. And then there is Erika. 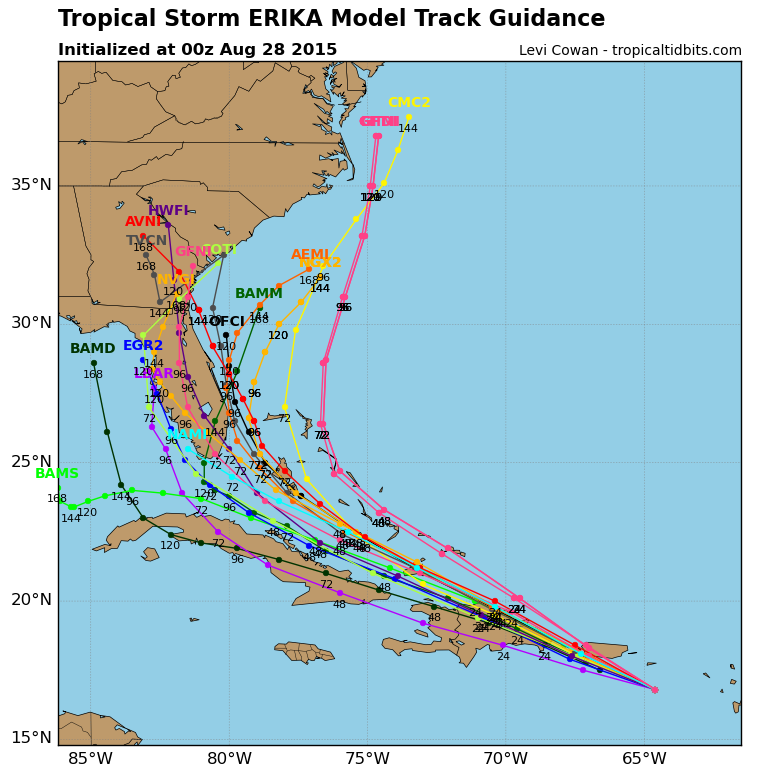 The three images below show the variety of possible paths for Erika that are being produced by the various models. The first image shows that there is fairly good agreement in the models for the first couple of days, although some keep the storm over ocean and others put it over land. That can cause big differences in the eventual strength of the storm, since ocean is flat and wet and helps the storm strengthen, while land is dry and mountainous and tends to weaken the circulation. Many paths put it near Florida, but some put it on the west side of the peninsula while others put it to the east. In this set of runs, a number of the predictions put the storm into Georgia later in the forecast period, but not all of them. In the second map, one model, the GFS, was run many times with slightly different starting conditions each time and the result is the series of purple lines shown. Again, note the range of possibilities, including one that does a loop over Montgomery AL, while many others recurve to the northeast without ever touching land. The white line is the average of all the individual lines. The third map, from the South Florida Water Management District, shows a combination of the first two maps with a couple of extra models thrown in. And this does not even show you the forecasts for storm intensity, which is harder to predict than path. How do you know which is the right path to pick? Different models do better at different times. When Hurricane Sandy hit New Jersey a few years ago, there was only one model that got the westward curve back to land correct–the European model. Eventually the other models came into agreement with that and the confidence in the forecast increased, but not many forecasters would have chosen that as the “right” answer several days out. 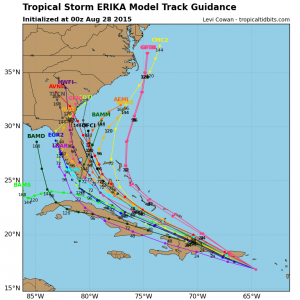 We don’t know which of these predictions of Erika’s path are going to be right, either, which is why forecasters use a “cone” to designate an area within which they think the path will fall based on the spread of the models. The cones are a lot smaller now than they were when Katrina came onshore ten years ago, which shows you how much hurricane forecasting has improved. So, we probably won’t know if Erika will affect the Southeast until Saturday or so, when it has either dissipated due to interactions with land and wind shear, curved off to the northeast, or grown to a hurricane over the warm waters near the Bahamas. We don’t know if it will be strong enough to cause a lot of wind damage or if rain will be the main problem (see Dr. Jeff Masters’ blog on the flooding in Dominica today from the weak TS Erika (or the Washington Post article), and remember that the 1994 floods in southern and central Georgia were caused by a weak tropical storm Alberto). But it is hurricane season, so you should be prepared for whatever nature throws at you. Do it now! Posted in Climate and Ag in the news, Climate science, Tropical weather. Bookmark the permalink.